The Flyers traded up in the 2nd round of the NHL Draft to select Isaac Ratcliffe. 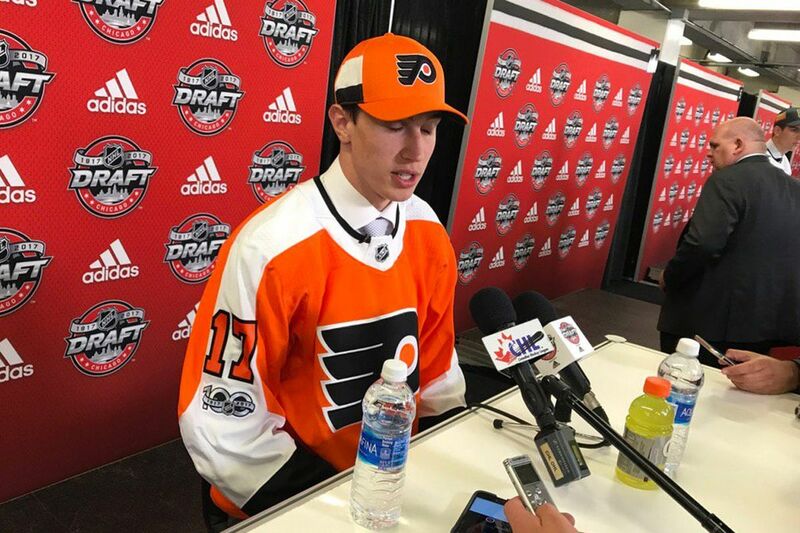 CHICAGO _ The Flyers traded up in the second round and selected left winger Isaac Ratcliffe with the 35th overall pick Saturday at the United Center. The 6-foot-6, 200-pound Ratlcliffe, who says he models his game after Rick Nash, was acquired after the Flyers sent their 44th, 75th and 108th picks to Arizona. Playing for Guelph in the Ontario Hockey League, Ratcliffe had 28 goals and 54 points in 67 games last season. He was rated as the 27th-best prospect by draft expert Bob McKenzie and 47th by draft guru Craig Button. "I'm numb," said Ratcliffe, adding he has known Flyers winger Travis Konecny for a while. "It's going to be awesome." Ratcliffe said the draft was "unpredictable" and that he didn't know if he would go in the first round Friday or slip into Saturday's rounds. "I'm just unbelievably proud and excited to say that I'm now a Flyer," he said. "..It feels surreal." Ratcliffe said he needs to gain weight and get stronger "to get to the next level." Added Ratcliffe: "I believe I can be one of the top players in this draft with my size and with my talent and with my progress in the future." Ratcliffe said the Flyers were one of the first teams to interview him at the recent scouting combine in Buffalo. He has played left and right wing and center. He said he tries to emulate Nash's style. "He's a big guy like myself and I think he moves well," he said. "He has that offensive instinct, but he can play well in the defensive zone."